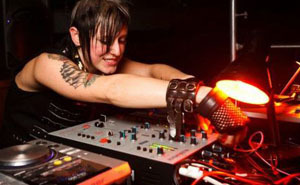 Kasey is one of the most prominent female DJs in Vancouver’s club scene, and has been setting dancefloors on fire since 2007. She’s proven herself as a heavy hitter with multiple residencies, at Sin City and beyond, headlining shows and frequent tours. With a classically trained background, she went from learning piano and music theory from her Polish mother, to fronting punk rock bands, to taking her knowledge and passion for music to the studio and dance floor. Her massive dirty electro and tech-house sets have earned her a heavy following, as well as a happily accepted DJ residency invitation in De:Basement, the all-electronica underground dance room at Sin City. Further afield, she’s played alongside artists such as Steve Aoki, Tom Stephan and Kreayshawn to name a few. She currently produces and remixes electronic music and plays at some of Vancity’s biggest clubs, although her passion and drive are setting course to a limitless future.